"Wouldn't it be nice if you could just drop your Camera RAW digital photographs in a folder, start an application and have your RAW files automatically converted and adjusted to whatever format and adjustment parameter you want? Yes, it would. 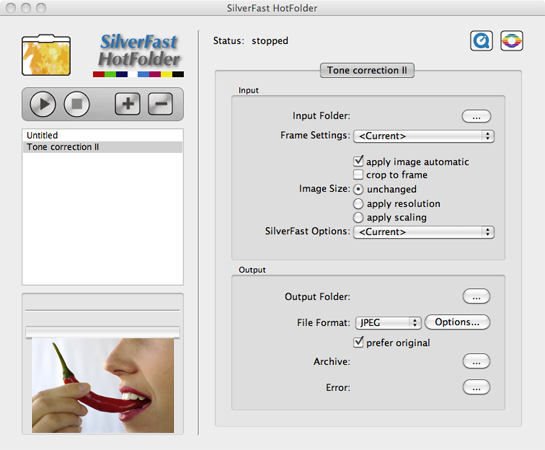 SilverFast's Hot-Folder system does that [...] from scanners as well as from cameras ..."
The SilverFast Hot-Folder feature makes scaling, sharpening, color separation and optimization of image data a much easier task and is, furthermore, time-saving and effective. Regardless of what kind of images have to be post-processed, optimized or converted into other color spaces, these images can now be automatically processed with the Hot-Folder system, instead of requiring a time-consuming and tedious manual adjustment for every single image. By default the original files will be stored in a special archive folder (non-destructive), to preserve the precious originals. Create up to 10 input folders, in which you will simply store the images that are to be processed. You can setup the processing parameters individually for each of these folders to be applied to every image in that folder automatically. Thus, you don't have to spend your time waiting in front of the computer. The processed images will be stored in the respective output folders once the processing has finished. Order the Hot-Folder feature as an add-on for your SilverFast version for the incredible price of $99.00 from our Online-Shop today. HDR Conversion: System-wide 48bit color space workflow. SilverFast HDR Studio supplies a high quality RAW conversion for RAW files from the latest digital SLR cameras. The conversion can be performed either as linear RAW (HDR 48bit data) or as gamma-corrected 24bit or 48bit data. Advanced automatic image optimization and a sophisticated USM sharpening algorithm are just two of the many SilverFast functions which can be added to the desired process. RGB workflows for scanners and digital cameras are common these days. In reality, all generic RGB data requires output-dependent optimizations - for example, a resolution adjustment relevant to the desired output size, assigning the ideal color space, actual image optimization, and finally, USM sharpening. The data is then separated into the selected CMYK color space. 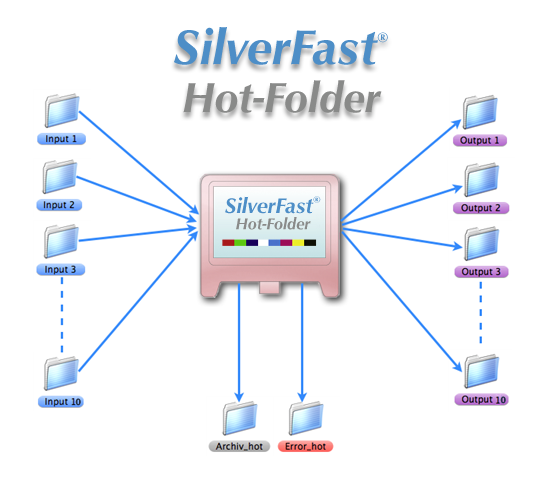 SilverFast's Hot-Folder technology handles all of these steps automatically. RGB data placed in a Hot-Folder is optimized and separated in accordance with the parameters assigned to the Hot-Folder. This automatic process eliminates the requirement of tedious manual editing for various kinds of applications. RGB data is ideally optimized with the SilverFast Hot-Folder option. In order to adjust RGB data, e.g. web applications or printing, an RGB to RGB conversion is required. SilverFast can handle this process with its integrated color management engine in a standardized way using existing ICC profiles like Adobe RGB, sRGB. ECI-RGB v2 or ProPhotoRGB.